Positive: High performance; powerful processor; long battery life; nice cameras; beautiful design. Negative: Relatively high price. Positive: Powerful hardware; high gaming performance; excellent display. Negative: Expensive. Positive: Good cameras; excellent display; USB-C. Negative: High price. Positive: Good display; nice gaming performance; decent speakers. Negative: Mediocre design; low autonomy; overheats while using. Positive: Nice display; attractive design; solid workmanship; decent cameras. Positive: Stylish design; excellent display; powerful hardware; high gaming performance. Positive: Powerful hardware; high gaming performance; excellent display; great speakers. Negative: Expensive. Positive: Powerful processor; good speakers. Negative: Mediocre design; inflexible fingerprint sensor. Negative: No microSD card slot; high price. Positive: Fast device; excellent display; long battery life. Positive: Powerful processor; excellent display; great cameras; decent speakers; high gaming performance. Negative: High price. Positive: Good hardware; nice gaming performance; excellent AMOLED display. Negative: Relatively high price. Positive: Powerful hardware; high gaming performance; solid workmanship. Negative: High price. Positive: Nice performance; beautiful display; decent cameras; long battery life. Negative: Unsupported waterproof; no wireless charging; no memory card slot. Positive: Powerful hardware; high gaming performance; premium design. Positive: Impressive design; powerful hardware; high gaming performance; excellent connectivity. Negative: Relatively high price. Positive: Powerful hardware; high gaming performance; premium design; excellent display. Negative: High price. Positive: Impressive design; powerful hardware; high gaming performance; excellent display. Negative: Relatively high price. Positive: Nice gaming performance; stylish design; great built quality. Model: The Asus ROG Phone is a smartphone built for gaming purpose. ROG, a famous sub brand of Asus, stands for Republic of Gamers and is a division of Asus that focuses on gaming, e-sports, and modding PCs. The company has made a lot of gaming laptops which look cool with heat vents, LED lightings as well as device designs inspired by different game environments and weapons. It is about time Asus implements these features to make gaming smartphones. This is a phone built to win. Its world-beating, speed-binned 2.96 GHz Qualcomm Snapdragon 845 Mobile Platform and Adreno 630 GPU deliver great performance not only for gaming but also to run multiple apps. The Snapdragon 845 on the ROG phone is slightly overclocked, thus it could produce more heat compared to other devices with the same processor. To combat with heat produced when a user is gaming, its unique GameCool vapor-chamber cooling system with detachable AeroActive Cooler makes up for an extra cooling boost and sustains high frame rates in the heat of battle. Using a combination of tough, precision-crafted 2.5D- and 3D-curved Corning Gorilla Glass with diamond-cut highlights and copper detailing, the metal-framed, water-resistant ROG Phone combines battle-hardened construction with a very comfortable gaming grip. The display is also one of the best in the market right now. It features an OLED 6-inch notch-free 18:9 panel that pushes a resolution of Full HD+. As a gaming smartphone, it has a refresh rate of 90 Hz, which is higher than a normal smartphone and it also has a 1 ms response time. With a wide 108.6 % DCI-P3 (sRGB 145%) color gamut, colors are incredibly vivid too, so game worlds look as glorious as they were intended. To further enhance the gaming experience, the ROG phone features DTS:X Ultra 1.0 which delivers incredibly realistic 3D audio rendering for any kind of games or virtual/augmented reality (VR/AR), featuring immersive 7.1-channel surround-sound with an enhanced bass response. On the back of the smartphones, there are two sensors which are a 12-MP one and a secondary 8-MP wide-angle camera. Although the camera is not the most attractive feature on a gaming smartphone, it captures decent quality photos, particularly with its wide-angle camera to capture wider angled photos. As for the battery, the handset features a large 4,000 mAh battery inside with support for Qualcomm’s Quick Charge 4 technology and USB-PD fast-charging. It will be important for the battery to support quick charge as gaming consumes more power. Asus also included other gaming features like a built-in nickel-plated cooler, a pair of capacitive AirTriggers, and two USB-C ports. 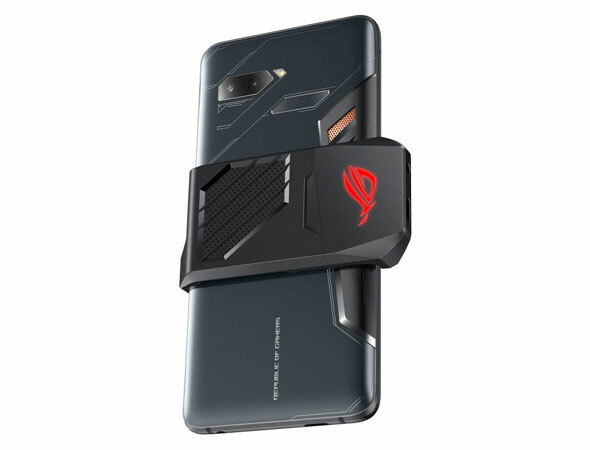 The Asus ROG phone also has multiple accessories to be picked up separately, which includes ROG Phone Case, Asus Professional Dock, GAMEVICE controller, Mobile Desktop Dock, ROG Suitcase, ASUS WiGig Display Dock and Twinview Dock. 82.42%: This rating should be considered to be average. This is because the proportion of notebooks which have a higher rating is approximately equal to the proportion which have a lower rating.